KFC is here to stay! When we were approached by MJZ and Mother to do the visual effects for KFC’s new ad, we were very excited. It was a chance to show off our CG expertise by creating a chicken and turkey to have a spaghetti-Western showdown in the crossroads of a Winter Wonderland-like landscape. 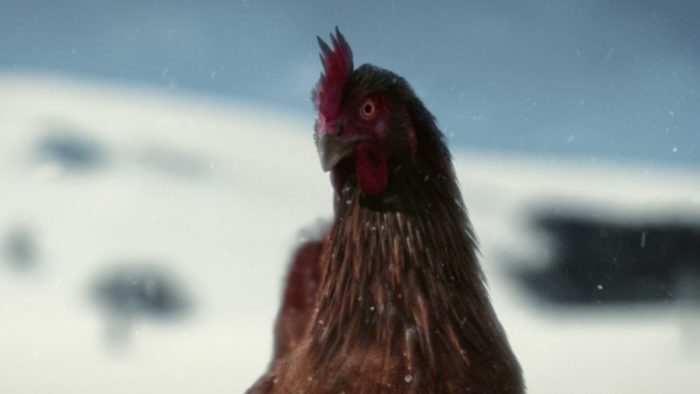 “We knew from the early storyboards that we were going to have to create a hero chicken and turkey that would be seen both at distance, in full body mid shots and in various stages of close up. The closest being super macro on their eyes. We also knew that the birds would need a full range of movement including flapping of wings and feather display for the turkey. Although we were making cowboy birds they still had to feel 99.9% bird so we started collating as much reference as possible of chicken and turkey movement. We also took a trip to the local petting zoo to get first hand slow motion footage of feather detail and movement. The build then commenced, we built in blend shapes to the models to allow for reductions or increases in skin volume once feathers had been added. Rigging was done alongside animation tests to make sure we could achieve the required range of movement. The animators were then challenged with creating the chicken’s cowboy walk. The brief was to create something “chicken like” but also incorporating a cowboy swagger. From all of our movement research we knew that chickens are full of twitchy jerky movements We definitely had to start with those but dial them back to a level that kept the essence of a chicken without making it look wide eyed and scared. Once we had worked out how the birds would animate, we moved on to the most challenging part of creating feathered creatures, the feathers themselves. Starting with the work done by Tighe Rzankowski at Houdini. We built the various feather types needed for each bird. Approximately, we then paired those modeled feathers with the Houdini fur tools to create a bespoke feather system. The system would both efficiently render realistic feathers, each as thousands of individual hairs whilst maintaining the complete groomablity of a hair system. Each feather would be unique in it’s bend, shape and size. For very specific areas like the wings, we modeled the entire wing feather layout with proxies, then swapped them out to the feather system for simulation and rendering. Once the feathers were built and groomed we had to work out how they would move without intersecting. We used various techniques for making sure the groom was evenly spaced and recorded distances between feathers to help removing intersections after animation. Feather simulation was also done using Houdini. We were able to come up with a set of levels of simulation, using simpler levels for distant shots and saving full feather interaction for hero shots. Check out the full ad here.